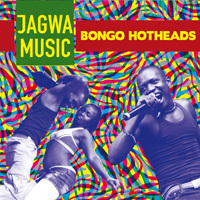 Dunia Watu from "Bongo Hotheads"
Shall we call this "Afro-punk" because of the DIY attitude and the creative use of noise and distortion? Or shall we refer to minimal or trance music? 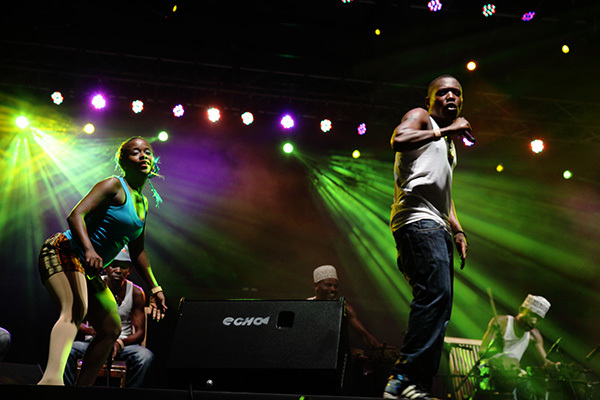 To the sexual energy of kuduro and mapouka? To the connection with any socially-conscious Western musical tradition (from rock to hip hop)? Or shall we simply welcome the advent of one of the most exciting bands around, and enjoy their exhilarating combination of pure energy, dazzling virtuosity and great showmanhip? 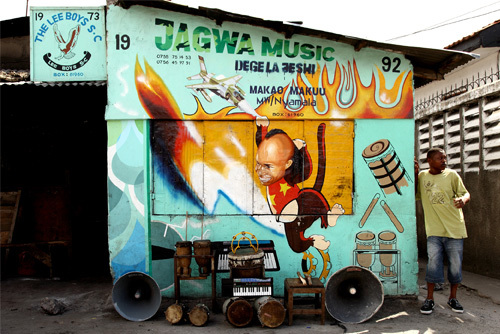 Jagwa Music are the leading exponent of the Mchiriku style, which originated twenty years ago in the poor suburbs of Dar es Salaam, when cheap Casio keyboards became available, and drew the attention of bands who were playing Chakacha dance music. What happened next is reminiscent of other, by now familiar stories (like that of Konono No.1): Jagwa Music & their peers were immediately attracted by the Casio's lo-fi sound, adopted it, hooked it to vintage amps and megaphones, and the resulting gritty, edgy, distortion-laden sound was rechristened Mchiriku. This new style has been thriving ever since in Tanzania, although it's been deliberately ignored by the media, as it is associated with uhuni (thuggery) and the city’s low life. 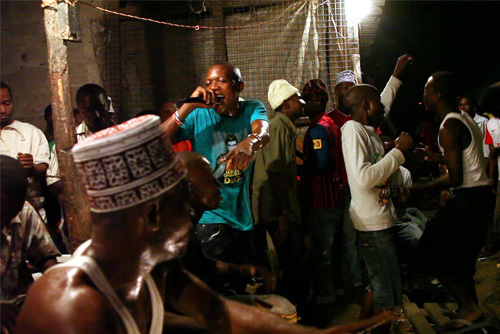 Jagwa Music have a large following around Dar es Salaam: almost everybody knows their songs, which relate to everyday issues. Many of their lines have become proverbial, and you can see quotes from their songs painted as slogans to the sides or backs of the local dala dala bus taxis. The songs often contain advice on how to survive in the city, when you're faced with unemployment, oppressive relatives, AIDS and unfaithful girlfriends or husbands, drugs and alcohol. 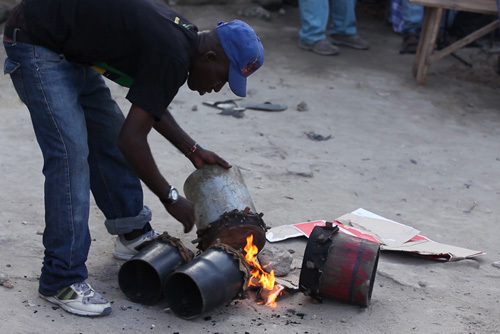 Jagwa’s members are all living the street life themselves, mostly working in Dar es Salaam's cut-throat private bus-taxi business as dei-waka (unlicensed drivers who jump in when another driver is caught by police, or does not make it to work). Others are manamba, who hustle customers into the buses for a few shillings in return. By mid-day they will have made enough money to keep them going until the next morning, paying for food and some of the other enjoyments they may like. In the afternoon they all meet at their maskani “hangout” under a tree in Mwananyamala close to Jolijo’s, their patron’s little house and restaurant. When they need to rehearse new songs, they convene in Jolijo’s backyard to get it all down. 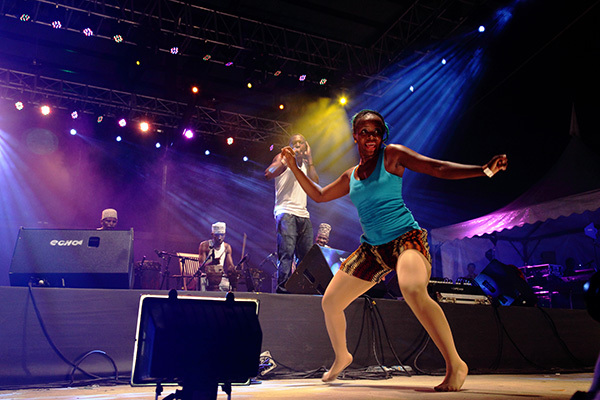 Their performing weekend usually starts on Friday when they suspend the week’s hustle, relax during daytime, and play all-night mchiriku gigs at family celebrations such as weddings around Dar’s suburbs or smaller towns in the vicinity. 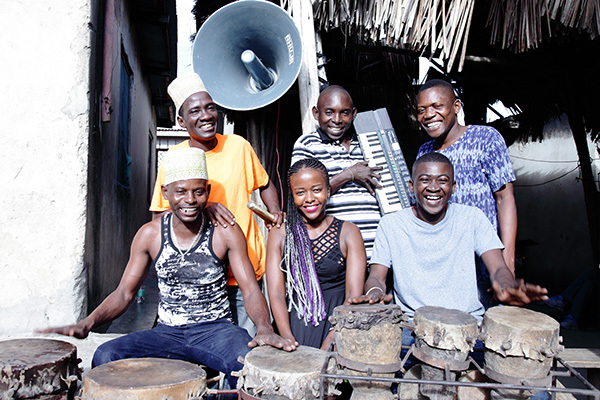 Mchiriku’s and Jagwa’s defining sound emanates from a small vintage Casio keyboard that also gives the style its alternative name Mnanda (from kinanda, a “small musical instrument/box”). Actually Mchiriku originated when these keyboards first became available in the early 1990s: The Casio’s cheap lo-fi PCM sounds acquire more of the desired grit and distortion necessary for Mchiriku when they are hooked to even more vintage amp and megaphone combinations, with additional flavor added by the effect of a natural “voltage drop” on the electronics when the internal batteries are running low in the course of their usually all-night performances around Dar es Salaam. A search around the internet confirms that some of the ‘natural’ sound effects of Mchiriku are actually well en vogue with so-called ‘circuit-bending’ technician/artists around the globe; judging from the prizes paid on ebay for some particular models of these vintage Casios they are in high demand with many contemporary musicians. Now for those wanting to go out to set up their own Mchiriku band: only two of the vintage models are suitable as Casio changed the sound on subsequent editions. As further bricolage items you need to be in touch with local plumber for the plastic pipes to manufacture some of the bigger drums; also have some goats on standby for skins. Otherwise you need a solid olden stool and some good sounding sticks (claves) to beat, a rusty bicycle bell. Don’t forget the old Japanese Toya amp and a megaphone. 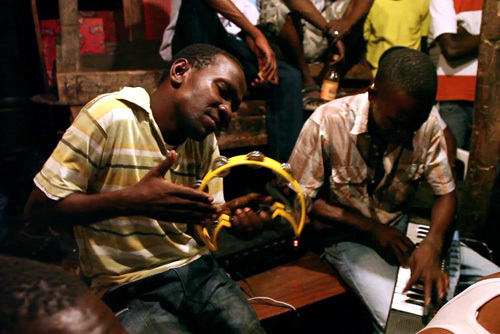 Mchiriku is collective improvisation—kind of stood on its head—yet perfectly situated in local aesthetics: While the Casio/Kinanda is the only melodic/harmonic instrument, it usually holds down fixed patterns for the song and the faster dance sections called Mtapa, its excitement being created by the shifting patterns generated in relation to the percussion instruments and the distortion/feedback patterns emanating from the combination of playing technique/ amplification system. As such the Casio is akin to the nzumari (a double-reed oboe-type instrument) used in old-time ngoma and with similar functions of leading segues from one song to the other or signalling a change of pace and pattern As already brought to the fore by the number of players (four), percussion is a most important element of mchiriku: The master drummer plays misondo (two mid-sized hand drums and the deep bass drum all made from various sizes of plastic pipes), filling in is the dumbak player (two small carved hand drums and an array of differently pitched drums played with sticks); vijiti two small sticks beaten on a wooden stool and rika (tambourine) or chekeche (maracas) complement the drums. 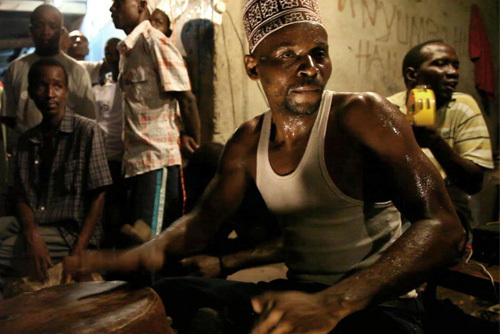 Master Drummer Mazinge meanwhile holds down the quick rhythm on the smaller misondo, all the while commenting on and supporting the vocal message with the bass msondo; this bass sound also guides and incites the dancers in the faster second part of songs. Of late Mazinge has added two more bass drums to his assemblage creating thus a more complex counterpoint to the vocal lines and adding more depth. TP’s dumbaki lock into the basic rhythm with higher pitched sounds, when all is ready to burst in the mtapa section he adds further layers of sound and excitement with the three tuned, stick-beaten drums. 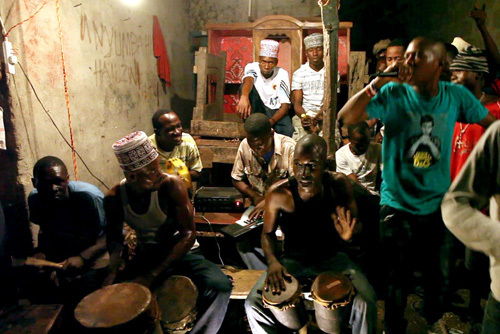 Together with the stool-and-stick combination and the tambourine/bicycle bell combination the whole percussion section does not just create rhythm and time (horizontal organization) but also shifting patterns of sound and a layering of pitch levels that is typical of much African music-making in general. 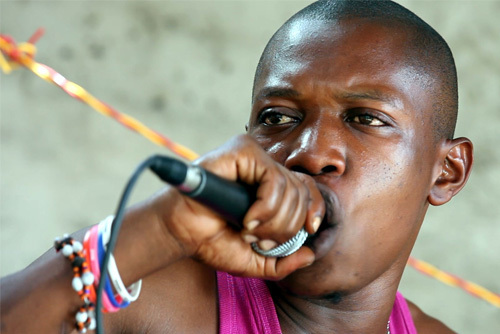 Jagwa’s songs typically comment on day-to-day issues of life in the city and many have become proverbial with time, titles or phrases being painted on the sides or backs of the dala dala bus taxis plying the streets of Dar es Salaam. Hardly dealing with unrequited love the songs advise on how to survive in the urban maze faced with unemployment, oppressive relatives, Aids and unfaithful girlfriends (or husbands for that matter), black magic, drugs and alcohol. Don’t think it could be bought! If you do not respect me, how do you expect me to respect you? If you do not clean up in front of me how can I do it for you? Just so they can be happy at your failure! They will make efforts to advance their lives. To hate does not get you anywhere!